Last month, Harry Belafonte passed the torch of singing activism to Tom Morello and presented him with the Officer’s Award from the Sidney Hillman Foundation, honoring excellence in journalism in service of the common good. 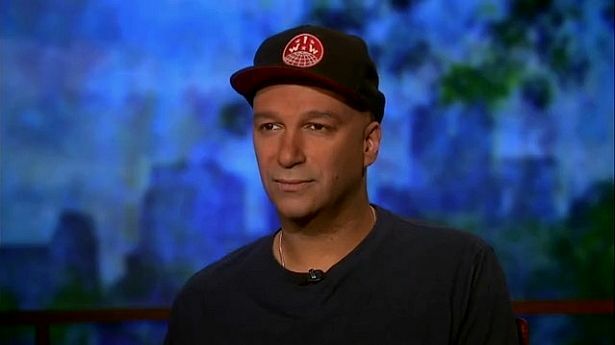 From Libertyville, Illinois and Los Angeles, California to Madison, Wisconsin and Occupy Wall Street, this weekend Morello, also known as the Nightwatchman, brought his songs to Chicago, where he stood with the National Nurses United and Iraq and Afghanistan Veterans Against the War and is scheduled to play a Woody Guthrie Centennial celebration. Earlier this week, Bill Moyers took the time to speak to Morello, a discussion that will surely solder his status as a link in the chain of the tradition of singing for justice—though his actions have already spoken loud and clear.